Dubai, UAE, January 08, 2019: Eberhard & Co., a watchmaker with a passion for motoring, supports motoring enthusiasts around the world. For almost 30 years, the company has been one of the main sponsors of some of the most fascinating motoring events, in particular those dedicated to the world of vintage cars, rallies, regularity races and concours d’elegance. 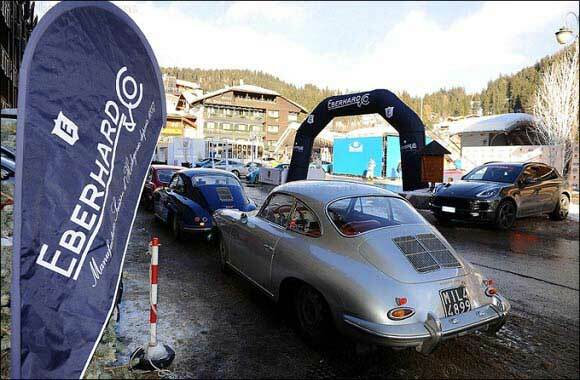 Eberhard has been confirmed as Main Sponsor and Official Timekeeper for the 31st edition of the Winter Marathon, the most eagerly-awaited winter event in the world, scheduled for 24 to 27 January 2019 in Madonna di Campiglio. A long-established tie unites Eberhard & Co. with the world of speed and challenges with a retro flavour going back to 1991, when the brand dedicated a special collection of watches, inspired by the automotive style of yesterday and today, to one of the greatest drivers of all time, Tazio Nuvolari, also becoming a sponsor of the most important event bearing his name. Since then, the brand has been present at many of the most significant national and international events on the racing calendar for historic cars, reflecting their style, refinement and attention to detail. The Winter Marathon which confirms its position as the most important winter regularity event for historic cars, is one such example. For the 2019 edition, the organisers have decided to keep the race format divided into two separate stages, increasing the number of timed trials to 65 (an absolute record for the event).